Antimetabole is a figure of speech in which a phrase is repeated, but with the order of words reversed. John F. Kennedy's words, "Ask not what your country can do for you, ask what you can do for your country," is a famous example of antimetabole. Antimetabole appears in a wide variety of contexts, from jokes and idioms to political speeches and literature. It can be used to convey paradoxes and irony, to strengthen an argument, or to show in a novel way how two ideas relate to each other. Antimetabole is tricky to use: it can be moving, memorable, and persuasive, but it can also feel trite and predictable if used poorly. Antimetabole comes from a Greek phrase that means, "turning about in the opposite direction," and which sums up the effect of words being repeated in reverse order, sort of like retracing steps on a path. There are a few additional nuances of antimetabole that are helpful to know in order to understand it. The French work to live, whereas Americans live to work. Typically, antimetabole occurs in adjacent phrases or clauses. But since the heart of antimetabole is the inverted repetition of two phrases or clauses, the repetition can also be spaced farther apart, embedded in longer sentences or even separate sentences. In this quote, Sarah Palin's use of antimetabole occurs at the ends of two separate sentences as opposed to back to back. This example takes a statement of integrity and boils it down to a short sentence, but it doesn't really offer any evidence to back up how or why the speaker's words and actions align. Antimetabole can fall flat as empty-sounding claims when the argument's logic isn't further supported or explained. In addition, because antimetabole is based on a single repetition of a phrase, it can only make, at most, two separate claims. As a result, using antimetabole can result in the exclusion of other possibilities that aren't encompassed by those two claims. This has the potential to create a false dichotomy—a misleading opposition of two ideas that aren't necessarily opposed to each other, leaving out other, more nuanced possibilities. For instance, in the above quote by Sarah Palin about John McCain, she suggests that candidates either "use change to promote their careers," or "use their careers to promote change," as if there can be no overlap or gray area between these two types of behavior. Of course, oftentimes such oversimplification is intended, as speakers may use antimetabole with the intention of making their point persuasive enough to distract from the more complex nature of the subject. Other times, a speaker or writer using antimetabole may not be aware of how they are reducing a complicated topic to something that is overly simplistic. Antimetabole is the repetition of words or phrases. Chiasmus is the repetition of similar concepts within a repeated grammatical structure , but doesn't necessarily involve the repetition of the same words. "Who dotes, yet doubts, suspects, yet strongly loves..."
This is an example of chiasmus because (as in antimetabole) the same concept is repeated in reverse order, but (unlike in antimetabole) different words are used to express the concept when repeated. "Doting" and "loving" are similar but not the same—and the same goes for "doubting" and "suspecting." Generally, chiasmus allows more complexity than antimetabole because antimetabole needs to repeat the same words, but for this same reason antimetabole can sometimes seem snappier and more clever than chiasmus. Stricter definitions of chiasmus maintain that it never involves the repetition of the same words, which would mean that antimetabole could not be a type of chiasmus. Most definitions of chiasmus hold that it can involve the repetition of words, in which case antimetabole would be a type of chiasmus. First, it's worth it to know that this debate exists. Second, we think it makes sense to go with the majority view and treat antimetabole as a specific type of chiasmus. In that view, all examples of antimetabole are also being examples of chiasmus. For instance, had Iago instead said "Who loves, yet doubts—doubts, yet loves," that change would turn the sentence into an example of both antimetabole and chiasmus because it would repeat both the same words as well as the same grammatical structure and related concepts. Antimetabole appears regularly in literature, speeches, common expressions, as well as in jokes. Antimetabole is regularly used in literature, for a variety of different purposes, from exposing a paradox to creating memorable mottos. In George Orwell's book 1984, the narrator's struggle to come to terms with a paradox is wonderfully captured through the inverse repetition of antimetabole. The paradox is that members of the oppressed working class will continue to go about their lives unquestioningly until they become conscious of their oppression—but it seems that a radical change or revolution would need to take place in order for the oppressed working class to even understand that they are oppressed. Note how in this example the phrase "they will never" isn't repeated verbatim, but the same meaning is conveyed through "they cannot." In Their Eyes Were Watching God, the narrator uses antimetabole to explain how women can construct their own reality by picking and choosing what to remember and what not to. "Now, women forget all those things they don’t want to remember and remember everything they don’t want to forget. The dream is the truth. Then they act and do things accordingly." The inverted repetition of antimetabole in this quote helps to emphasize the way that the narrator is implying that women have both sides of the equation covered: they both forget what they want to, and remember what they want to, and that total control allows them to create their own truth. Antimetabole in John Keats' "Ode on a Grecian Urn"
The way that the use of antimetabole here condenses this idea into a concise, declarative statement gives it a feeling of power and gravitas. Antimetabole can be a powerfully persuasive tool in oration. Its use of repetition drives concepts home and helps them stick in the memory. It's important to keep in mind that, because antimetabole packs a rhetorical punch, it can permit a speaker to make a claim so powerfully that listeners don't notice that the speaker never offered any evidence or explanation to support their claim. This is, of course, precisely why some orators use antimetabole. Malcolm X uses antimetabole to concisely argue that American history isn't what it seems. He first makes reference to the predominant narrative of colonialism—that white Europeans discovered America—then reverses the word order to make his own argument: that the arrival of white people to the Americas, along with the intersecting legacies of slavery and colonialism that came with them, wreaked catastrophic damage on entire races of people. We didn't land at Plymouth Rock. The rock landed on us. Below, John McCain uses antimetabole to criticize politics' influence on the integrity of lawmakers. In the first clause, he presents how things should be, and then he reversed the word order to say how they are—a common use of antimetabole. We were elected to change Washington, and we let Washington change us. Antimetabole's repetition and formulaic structure make it perfect for catchy phrases and popular expressions. Since comedy is all about the subversion of expectation, it makes sense that antimetabole is common in jokes. The structure of reverse repetition allows a comedian to present a sensible, common phrase, then to twist those same words to produce a surprising effect. What's the IRS's motto? We've got what it takes to take what you've got. Why Do Writers Use Antimetabole? Writers use antimetabole in a wide array of contexts: to produce powerful arguments, to compare two related things or concepts, to present paradoxes, or to generate a comedic effect. Most important ideas are unappealing and most appealing ideas are unimportant. Human rights are women's rights and women's rights are human rights. By not preparing at all, one in fact is preparing—for failure (there's the paradox). Wooden stresses the link between both preparation and success, as well as preparation and failure. But by using antimetabole, he accomplishes this very concisely, using just two key words. When antimetabole meets wit, it has a comic effect, largely because it's perfect for ironic statements. Below, the sentence claims an ironic relationship between having money and spending it. The richer people get, the tighter they become, and the tighter they become, the richer they get. Wikipedia Page on Antimetabole: A breezy definition of the term, but a large stock of examples. Manner of Speaking Page on Antimetabole: Short but smart notes on the use of antimetabole. Includes a couple videos of the device in action. 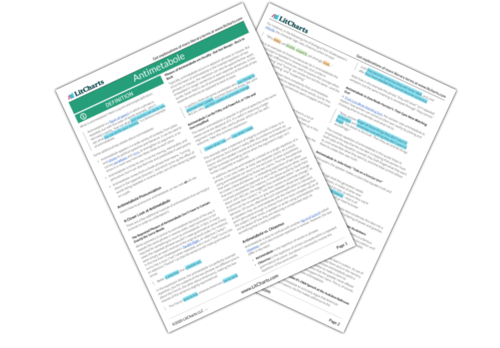 American Rhetoric Page on Antimetabole: A solid definition and a resource for good examples of antimetabole. Slate Article: A smart essay on both the clumsy and graceful uses of antimetabole in the 2008 presidential campaign. Star Tribune Article: A clever, light piece on the difference between antimetabole and chiasmus. Lambert-Sluder, Rose. "Antimetabole." LitCharts. LitCharts LLC, 5 May 2017. Web. 23 Apr 2019. Lambert-Sluder, Rose. "Antimetabole." LitCharts LLC, May 5, 2017. Retrieved April 23, 2019. https://www.litcharts.com/literary-devices-and-terms/antimetabole.